March 11, 2013  For this week's Sandwich Monday, we try Taco Bell's new Cool Ranch Doritos Locos Taco. It's everything you love about Cool Ranch Doritos and everything you love about Taco Bell and everything you hate about yourself! March 22, 2011  Outraged over having to pay an additional 50 cents for each Beefy Crunch Burrito, a man in Texas allegedly fired air guns and led police on a chase that ended when tear gas was fired into his hotel room. Now he's in jail and his bail is $50,000. 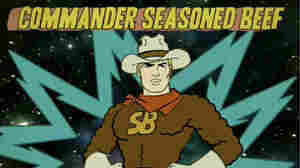 January 28, 2011  Will Taco Bell's Super Delicious Ingredient Force defeat Baron von Bland? A cartoon is part of the fast-food chain's spirited defense of its seasoned beef. A lawsuit claims many of the ingredients aren't beef at all.